They say commerce is a man’s world! Not just in India, but even in the developed world, the notion fairly exists. Interestingly, there are a handful of women who have done well for themselves in businesses to understand what it is like to succeed in the world of commerce, where men have ruled for years. The story of Aparna Rammohan is one such inspiring draft where she has proceeded with gumption to make a difference with her ideas, seek solutions that have never been sought, contributed in running a successful venture and generated employment for many and give rise to new sustainable ecosystems.Aparna currently leads SriSattva Group as the Managing Director of the Group. Aparna’s initial years of technical know-how, understanding client management, expectations of industry and process of business management is a result of her work tenure in PriceWaterhouse Coopers where she has learnt the true meaning of exposure, experience, enlightenment and met head-on the opportunity to realize her dream of making a difference in the SME Space. “While Corporate on the top of cadre could afford sound financial advisory services, what would the SMEs do? Growth Strategy is what I call it and the idea since beginning, was to partner with smaller but promising businesses towards shaping their growth through my business acumens, ability to understand market dynamics and expertise in assisting business to scale up,” Aparna mentions. Eventually Aparna' senthusiasm towards being involved with businesses to plan their growth kept her focused at domestic and international clients. With her growth strategies designed for the company, she paved way for some of the promising corporate in the countries namely Middle East, South Africa, the U.S., UK, Germany, Australia and Singapore. Attitude over Aptitude is what Counts! It is optimism that drives and inspires leaders across the globe to continue on their paths and give a tough fight to all in their respective fields. While women encounter various issues of acceptance in the corporate world, it is worth noting that the environment they choose to work in also plays an important role on their professional experience. With the same resilience, Aparna starts her day at work.”“Smile is the secret of my energy, no matter how stressed the situation is and how demanding my clients or team gets,” she says. She spends substantial time with the team - not just guiding them but also motivating them to partner with businesses towards their growth and go beyond being instructions followers. Aparna’s typical day involves three must have elements that includes managing people within and external to organization, managing process within SriSattva and for SriSattva’s clients and work towards innovative and dynamic output to meet Industry requirements. “I walk the talk with my clients till my strategy generates the desired output assisting the businesses to grow. Members of Smart India Initiative often look towards me to assist them with their individual professional growth, which again requires my specific attention. Then, there is of course my small but sincere and fully charged team who are my assets to achieve my dream of “Enabling Businesses towards Growth,” she informs. With her mantra of team motivationand belief in utmost customer satisfaction, Aparna just like a selfless brave heart leader leads the way and stands still with a fighting spirit and self-confidence. “In bitter times, I never walk away from the situation. I stay and hold the steering wheel of my client’s ship undergoing turbulence, steadfast along with the promoter. 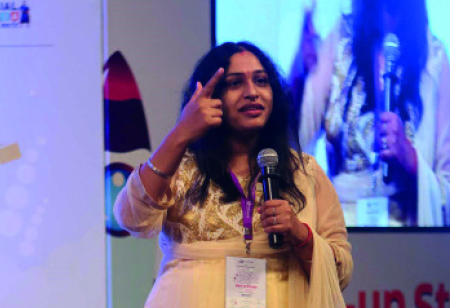 ”Aparna’s knowledge and capabilities to come up with innovative solutions has revived many of her clients’ dying or stagnant business by bringing the derailed business back on growth track through her growth strategy or maximizing its shareholder value through business partnerships or outright sale.
" Absolutely anything can be sold and any business can be scaled up, just that the Entrepreneur should do it right, through correct planning, proper execution, lots of perseverance and quick adaptation to change." Known to be a highly motivated individual who spreads her fervour to achieve and perform, Aparna believes scaling up is the only way to survive. She steers businesses towards the age old and proven concept of re-investment of profit towards growth. “That is the basis of Smart India Initiative – Helping Bootstrapped businesses scale up. It not only focuses on creating awareness on how to do, we practice what we preach, by going one step further and connecting businesses to prospective clients, vendors, professionals and investors, handholding them towards growth with our expertise and experience,” mentions Aparna. At SriSattva, Aparna and her team align themselves to the client requirement of Velocity – which they believe is the driving force behind consulting business.“We are living in exponential times and the name of today’s game is Speed. We have aligned our long-term strategy with this need,” she adds. Their practice is shifting to efficient ways of working, offering instant consulting solutions, being available for clients anywhere, anytime. This change would entail exploiting available technology and strengthening internal processes around service delivery while continuing our acute focus on quality of consulting and client service. 4. Aparna is invited to speak as subject matter expert at around 50 business forums each year.